Montana, Big Sky Country, also known as “The Treasure State”, “Land of the Shining Mountains” and “The Last Best Place”. I haven’t even been to Montana, but believe all of these nicknames thanks to the beautiful Montana ads I see all over Chicago especially on the CTA. Am I the only person who feels the need to desperately visit Montana whenever seeing those ads? 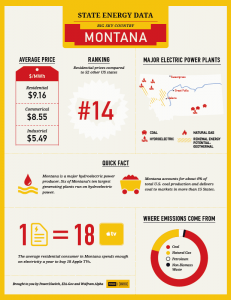 The next stop on our United States of Energy series is Montana. The state is ranked number 14 in residential electricity prices compared to 52 other US states averaging $9.16 Megawatts per hour. Montana is a major hydroelectric power producer. 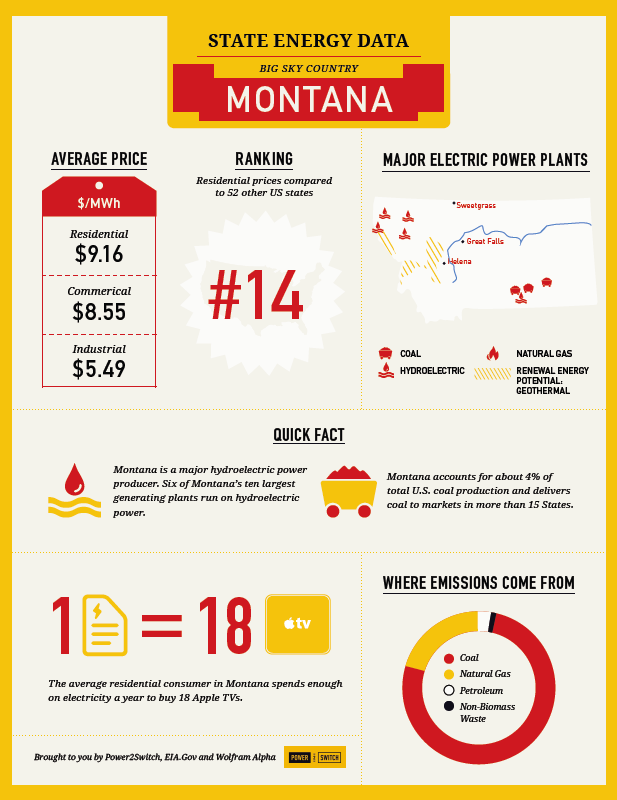 Six of Montana’s ten largest generating plants run on hydroelectric power. Montana accounts for about 4% of total US coal production and delivers coal to markets in more than 15 States. Did you know? In Montana the elk, deer and antelope populations out number the humans. Those Montana ads don’t lie… with the vast wildlife and beautiful nature scenery! Montana has the largest grizzly bear population in the lower 48 states. In fact, no state has as many different species of mammals as Montana. The average square mile of land contains 1.4 elk, 1.4 pronghorn antelope, and 3.3 deer. I hope I did Montana justice… see you there!